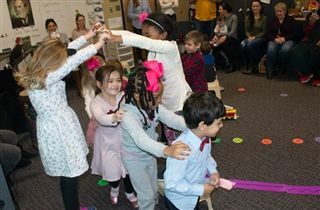 On March 1, JK parents joined music teacher LuAnn Hayes for a musical program featuring trains. Students used a variety of drums to illustrate the idea of movement, and even turned the music room into a giant train track complete with a bridge, tunnels, and a station! The musical ideas Ms. Hayes’ students are exploring are connected to their classroom study of transportation.